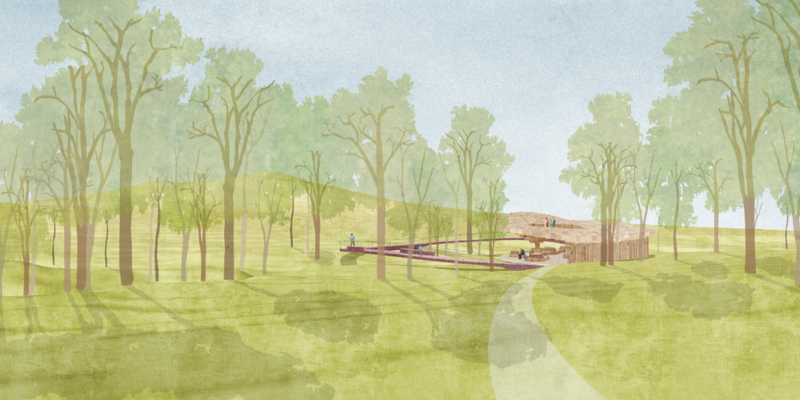 Berlin, Germany-based architect Francis Kéré has unveiled renderings for a planned musical pavilion set for the Tippet Rise Art Center in Montana. 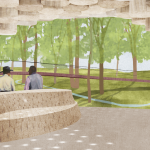 The free-form 1,900-square-foot pavilion is designed to provide refuge in the forest while mimicking surrounding trees through the use of locally-logged ponderosa pine and lodgepole pine timbers. The structure’s rounded surfaces and a sculptural drop-down ceiling are meant to echo the traditional designs of tongunas, sacred shelters built using wooden pillars and carved ornamentation by the Dogon culture of Mali. 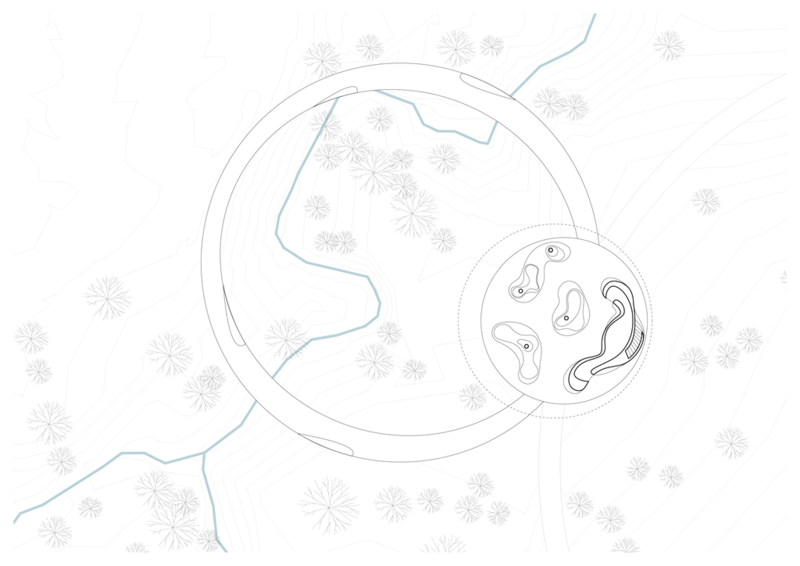 The pavilion will be accessed on the heavily-wooded site by a thin path and a circular bridge that meanders over meadows, a stream, and forested areas. 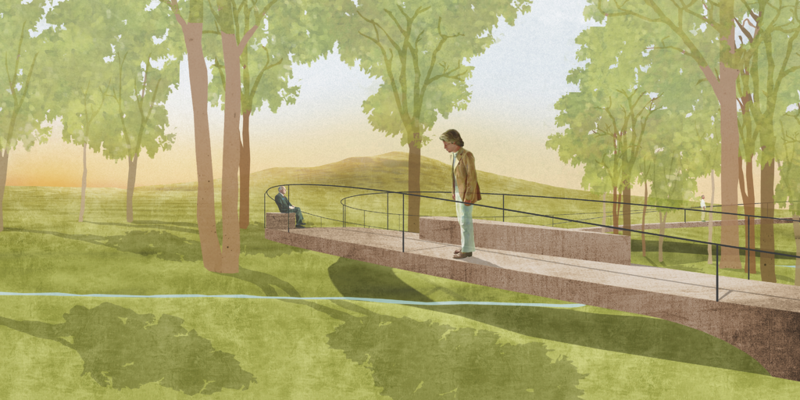 The passage is designed to only touch down on at two points in order to minimize the installation’s intrusion on the natural landscape. 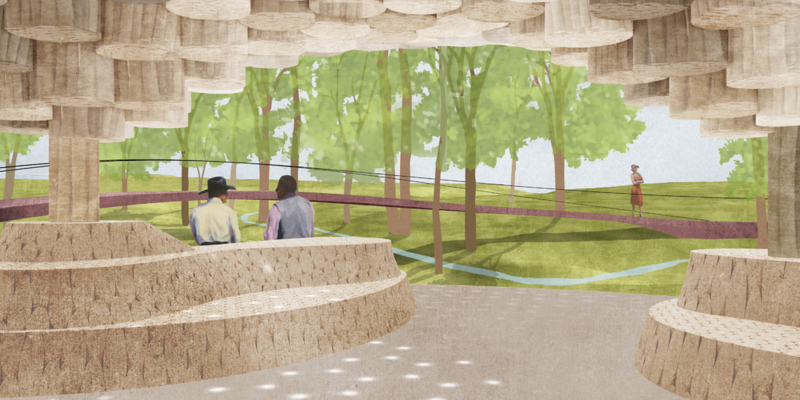 Inside the pavilion, integrated seating will provide views of the internal structure, including the sculptural ceiling, which is made up of the aforementioned dropped-down logs that create a so-called “rain of light” effect when they are illuminated by the low-lying sun. 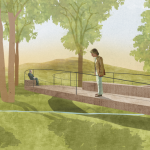 Laura Viklund Gunn of Gunnstock Timber Frames will collaborate with Kéré and his team as the local project architect. In the past, Viklund has helped to construct a variety of other installations at the arts center. 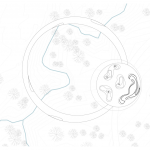 In conjunction with the project, the Tippet Rise Fund will provide financial support for the construction of a new school building in Burkina Faso, Kéré’s native country. 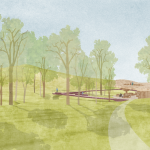 The woody pavilion is scheduled for completion at the start of Tippet’s summer 2019 program.